“At Hell’s Gates 2: Origins of Evil” is one hell of a rollercoaster ride. 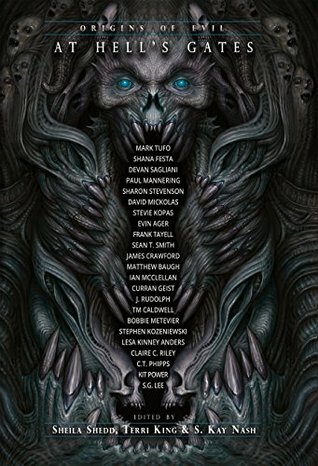 Not a solid fan of horror I purchased the anthology because of some very talented writers who contributed to the second edition and because the proceeds go to The Intrepid Fallen Heroes Fund. Knowing that there was a humanitarian cause behind the book made it certainly easier to connect with the terror within. 23 stories, all different yet powerful and showcasing diverse talent: The subjects range from a mousetrap to a starship, from personal to universal terrors, with heroes that include scientists, truck drivers, actresses, junkies and drug dealers. Some stories are more supernatural, others sci-fi, thriller and some plain horror. If horror is your thing, or you want to support a good cause, this anthology is for you. Highly recommended. Charitable horror anthology? LOL, now that ironic phrase got my attention. I had the same reaction, but it sounds like a worthy cause.